It is the month of April and many merchants and businesses have already started charging Goods and Services Tax (GST) for the various goods and services they provide. The GST replaces the former sales and services tax system (SST). Currently, only businesses with an annual sales turnover of RM500,000 and above are liable to be registered under GST. The threshold is set at RM500,000 to ensure that smaller businesses do not have to shoulder the costs of registration (including start-up and compliance costs) under the new taxation system. 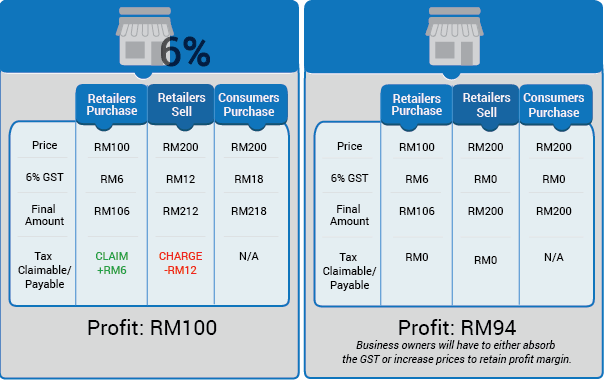 It is estimated that about 78% of total business establishments in Malaysia do not fall within the GST system. However, businesses that have not reached the RM500,000 turnover threshold can voluntarily apply to register for GST. Once registered, the businesses will remain in the system for at least two years. There are a number of benefits that businesses can obtain by registering for GST. For example, under SST, some businesses pay multiple taxes and higher levels of tax-on-tax, and they are not allowed to claim. With GST in place, businesses can claim on taxes paid on inputs and reduce the overall cost of doing business. 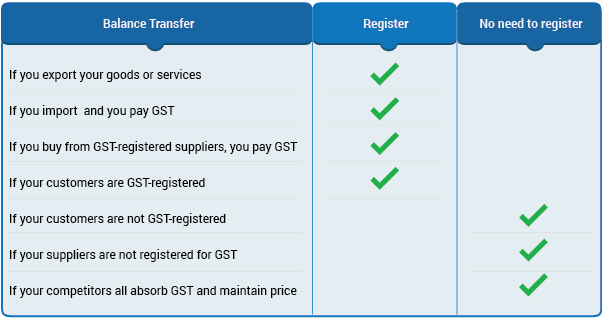 One of the foremost things to consider when determining whether to register for GST is whether your current or future suppliers are or will be GST-registered. If your suppliers are GST-registered and charge a standard rate of 6%, your business will benefit from GST registration as it will be able to make claims for the GST incurred on the purchases made from the GST-registered supplier. Your business will not be able to claim back the GST on your expenses or any goods you purchase for sale if it is not GST-registered. In this case, your business will have to either absorb the GST it has paid to its suppliers (resulting in a lower profit margin), or pass on the tax charges to consumers by increasing the prices of its goods and services (but risk losing customers). For GST-registered companies, If your business supplies products that are zero-rated (such as agriculture products and exported goods and services), it will be able to claim back the GST it had incurred in the production of the zero-rated supplies. Registering for GST can involve significant compliance and administrative costs that can burden a business, especially for a start-up. To begin with, staff will need to be trained to ensure proper business and accounting records for GST, as well as the correct charging and claiming of the tax. Systems will also need to be enhanced to cope with GST regulations. For example, you may have to set up an electronic payment infrastructure to enables sales to be captured accurately. Price displays and invoices will also need to be changed to reflect GST-inclusive charges. How will registering for GST affect your cash flow? Businesses are required to pay GST when the file for return, upon the delivery of goods or completion of services, even if they have not received the GST payment from their customers. This can impact their cash flow and result in increased financing cost. If they are unable to retrieve the money in six months or the debtor has become insolvent, the businesses are entitled to a relief for bad debt, where the GST paid will be returned. Another concern is if the expectation of a major sale or contract does not come into fruition. 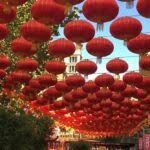 If this occurs, the business may have difficulty paying its tax bill. Businesses with a tight cash flow are especially susceptible to this risk. This is because they do not have the financial capacity to handle any unexpected cash flow problems. GST, which came into effect on April 1, was introduced to broaden the Government’s revenue stream, and is part of Putrajaya’s tax reform programme to enhance the capability, effectiveness and transparency of tax administration and management. Depending on the scale and nature of the business, it may be advisable for you to engage the services of a tax agent or a tax expert to ensure that all your dealings with GST are properly accounted for. To date, over 100 countries around the world have adopted GST (or some form of Value-Added Tax). Learn more about what will be taxed with GST here.